Does drug-induced sleep endoscopy identify candidates for electrical nerve stimulation for sleep apnea? Home | Sleep Apnea | Does drug-induced sleep endoscopy identify candidates for electrical nerve stimulation for sleep apnea? Posted May 21, 2013 by Dr. Kezirian & filed under Sleep Apnea, Tongue Surgery. Disclosure: I have served on the Medical Advisory Board and as a consultant for Apnex Medical, a medical device company that developed the Hypoglossal Nerve Stimulation System to treat obstructive sleep apnea. At no point did I own any portion of the company, although they did pay for my time devoted to company work, initially to me directly and then to the University of California, San Francisco. I was never paid for my writing of any research publications related to this work. Apnex Medical has recently ceased all operations. When we sleep, our body experiences a number of changes, including the relaxation of most muscles that can contribute to both snoring and obstructive sleep apnea. Because most of the tissues in and around our throat include muscles, this muscle relaxation allows these tissues to collapse more easily and become more floppy, narrowing the breathing passages (snoring and obstructive sleep apnea) and allowing more fluttering of the tissues (snoring). A number of sleep apnea treatments attempt to address this muscle relaxation directly or indirectly. One such approach has been the electrical stimulation of the hypoglossal nerve, the nerve that controls tongue movement. Because the tongue is largely composed of muscle, stimulation of this nerve can move the tongue forward dramatically, opening up the breathing passage in what I call the Tongue Region. Three companies have been working with hypoglossal nerve stimulation for sleep apnea over the past few years: Apnex Medical, ImThera, and Inspire Medical Systems. 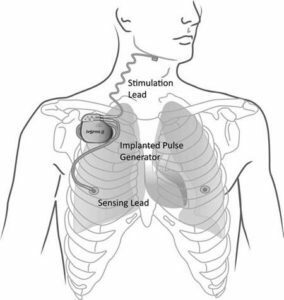 Without going into too much detail, all systems include an implanted pulse generator, similar to a pacemaker for the tongue. 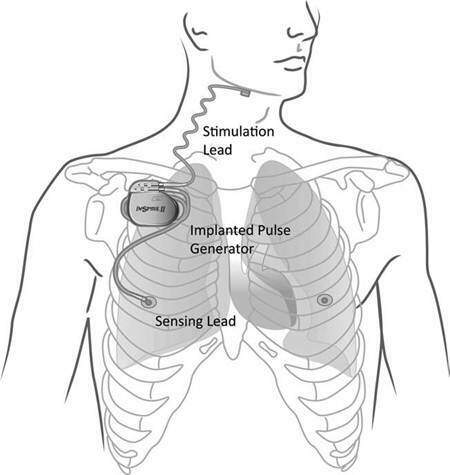 A stimulation lead (effectively a special wire) connects the pulse generator to the hypoglossal nerve to carry the electrical signal from the generator to the nerve. The Inspire Medical device, like the Apnex Medical system, includes a sensing lead that monitors breathing patterns so that the electrical stimulation occurs largely only while a patient is breathing in. My work with Apnex Medical led to a number of published research studies examining the benefits of hypoglossal nerve stimulation and how to identify individuals that might achieve the greatest benefit. The factors that have been examined to improve patient selection include age, body weight (adjusted relative to height with a measure called body mass index), and the number of times per hour that someone is having blockage in breathing (apnea-hypopnea index). Inspire Medical Systems and ImThera have also published their early results. The May 15, 2013 issue of the Journal of Clinical Sleep Medicine includes an article concerning the selection of favorable candidates for hypoglossal stimulation using drug-induced sleep endoscopy, an evaluation technique about which I have written on my main website and this blog. A number of European colleagues published their work in a total of 21 subjects who were implanted with the Inspire Medical Systems hypoglossal nerve stimulation system during the initial studies of that device. They compared treatment outcomes with the findings from drug-induced sleep endoscopy performed prior to surgery. The study showed that individuals had worse outcomes if they had one specific finding during drug-induced sleep endoscopy, complete concentric collapse in the Palate Region. Complete concentric collapse in the Palate Region is total blockage in the area behind the roof of the mouth (soft palate) due to collapse from both the soft palate itself and the side of the throat (lateral walls) in that area. In our work with the Apnex Medical system, a previous study showed that hypoglossal nerve stimulation not only can move the tongue forward to open the breathing passage in the Tongue Region but also, in some patients, can also open the breathing passage in the Palate Region (likely related to the anatomical connections that other structures have to the tongue, such that they are also pulled open). This new study suggests that moving the tongue forward with hypoglossal nerve stimulation may not be sufficient to open the Palate Region in those with more-pronounced Palate Region blockage that complete concentric collapse during drug-induced sleep endoscopy suggests. One limitation of the Inspire Medical Systems study published this month is that there were some differences in the way that the hypoglossal nerve stimulation was performed early (a group that included all the subjects with complete concentric collapse) vs. later in this study, as the early results were not as good as they hoped, prompting changes in the study protocol and the device itself later in the study. As you can imagine, an implanted medical device like this is an expensive treatment option for obstructive sleep apnea. However, the early results from the three companies that have been working in this area have generated substantial interest. Simply, hypoglossal nerve stimulation has the potential to treat certain patients with sleep apnea that do not respond well to other therapies. Like any treatment, a goal is to select only the most ideal candidates for hypoglossal nerve stimulation before they undergo a procedure to place this device inside their body. This study’s finding that those with complete concentric collapse during drug-induced sleep endoscopy are unfavorable candidates is intriguing and sure to be revisited in future studies of all hypoglossal nerve stimulation technologies. Do you know if UCSF is performing the surgery to implant the device for upper airway stimulation and if there is a physician in the Bay Area who is skilled in determining the appropriate candidates for the above? I am a Kaiser member. I saw a surgeon who trained at Stanford and she is recommending a multi site surgery, done at one time, rather extensive, and I am interested in finding out about this less invasive procedure. I am sorry to have taken so long to respond. There is nobody currently in the Bay Area that is performing this, although there should be in the future. I have had a number of patients come to see me from the Bay Area regarding this technology. The downside to traveling is that there will be multiple trips involved, although for patients who come from a distance we can minimize the number of these visits.